“When life gives you molasses you make rum” and that’s what the forefathers of the Bundaberg Rum Distillery did in 1888. Molasses is a by product of sugar cane, a major crop in this part of the world, producing up to 95% of Australia’s sugar. So the story goes that Bundaberg had all this molasses filling up all their spare barrels. There was apparently so much that it was overflowing into the streets and the local rivers making the inhabitants of the area rather concerned. So a bunch of local growers go together, probably at the pub, to try and come up with a solution to the problem…and Bundaberg Rum was born. Today’s distillery still stands on the original site, with 2 previous facilities having been burnt down in the same space early last century. Apparently burning distilleries give off a great fireworks show. So Bundaberg is the current stop on our journey to the Cape and of course I couldn’t visit Bundaberg and not visit the distillery. My mum just happened to be in Bundaberg for a visit at the same time and so accompanied me. We booked online, saves 10% off the ticket price, and we went on the guided tour so it was $22.50 each and I believe it was worth every cent. Our tour guides Lee and Sam were knowledgeable, entertaining and obviously loved rum and their jobs. Please note: no cameras are allowed on the tour so I have no pics of the tour to put into this blog. First stop was the massive molasses pits where the sugar mills dump the molasses, which looks like sludgy coffee at this point. From here it is cleaned and comes out a dark, clean syrup which we tasted on the tour. The next part is the turning the molasses into alcohol (fermentation) by adding yeasts and then distilling the alcohol until it is clean and potent. The alcohol is then matured in massive wooden vats. Each vat costs about $100,000 to build and holds about 75,000 litres of rum, retail value is $6 million. Bundy rum is matured for a minimum of 2 years, sometimes longer depending on the batch. 2 years in the government standard. It is then diluted to the right alcohol content, tested and piped into the bottling area where the machine bottles 120 bottles a minute. All premixes are made in NSW where unmarked tankers transport the undiluted alcohol direct to the factory outside of Sydney where they are mixed and packaged on site. Once the tour was over we were taken to the Bundy Bar where our ticket allowed us two tastings of our choice, bargain! I was able to try the Bundy Royal Liqueur, only available to purchase onsite, as they are unable to keep up with demand for this amazing product, and the latest Master Distillers Collection 280. Mum and I loved this tour, it was very much worth the money. End note: unfortunately the morning after I went on this tour and wrote the blog I heard that the Bundy Rum factory is being relocated to the factory outside of Sydney. It’s incredibly sad that Bundaberg is going to lose this ionic and integral part of the community and a massive chunk of history. 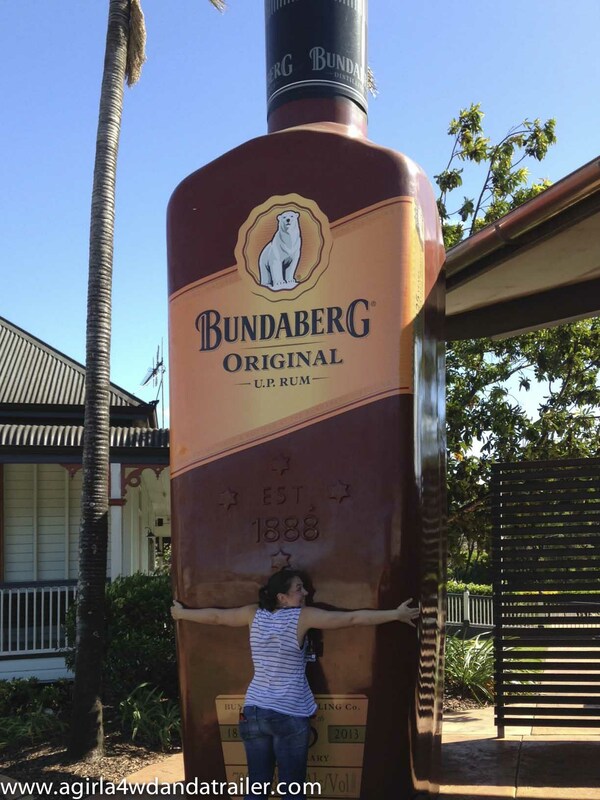 This entry was posted in QLD and tagged Australia, Budget Tour, Budget Travel, Bundaberg, Bundaberg Rum, distillation, distillery, fermentation, Historic Site, Molasses, museum, Queensland, Rum, sugar cane on May 19, 2014 by monicabugno.